When choosing the correct free-standing roller banner stand, there are a few areas you may need to explore before deciding on the right one for your purpose. You will need to ensure you have the correct size roller banner stand by choosing the width and height you desire and making the correct decision by looking carefully at your budget. 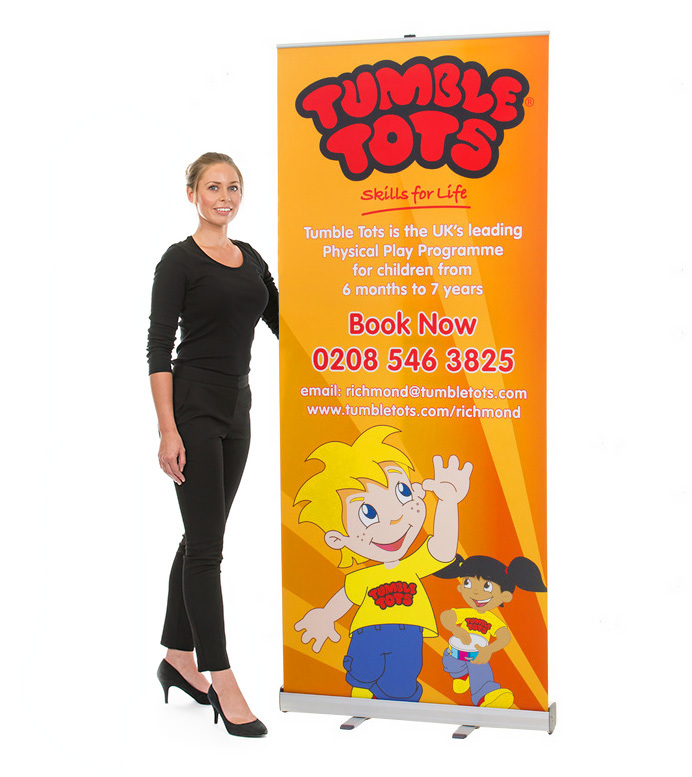 Single sided pull up banners are perfect for events where you are using roller banners as part of your backdrop. Our best selling banner is our Grasshopper banner stand. It is not only a great entry level choice but it incorporates a large number of features that our premium range also include. Our Grasshopper banners use the same high quality print and banner media as the more expensive stands in our range. Available in a wide range of sizes starting from 800mm wide. Supplied with a carry bag for effortless storage and transportation. The silver anodised aluminium base features two twist out feet which keep the banner stand stable in use. A great alternative to our grasshopper roller banner is the Orient pull up banner stand. This stylish banner comes complete with a carry bag for storage and transportation to protect your marketing tools up to the event. The front-loading graphic provides a premium look whilst providing a large visible graphic area. Available in five widths, each Orient roller banner can be assembled in minutes by one person, providing a quick and efficient marketing tool. Our Orient banners are laminated to ensure resistance against wear and tear. This means they are resistant to tears, scratching and creasing, giving you a longer lasting display solution. Double sided roller banners are a great marketing solution where your stand may be seen from multiple directions. Our Excaliber 2 Roller Banner Stand is the perfect solution for your exhibition needs when 360 degrees brand promotion is needed. Our Excaliber roller banner comes complete with aluminium hardware case, printed graphic and a carry bag. The Excaliber banner stand can be purchased with added accessories such as the iPad holder and monitor brackets, helping engage and interact with customers at your event. The advantage of the replacement cassette range is that the graphic cartridge is manufactured separately from the main base unit. This means it can easily be removed and replaced with new graphics as you won't have to return the whole banner or have to buy a brand new banner completely. Our Merlin Replaceable Cassette Banner Stand is one of our best value pull up banner's with replaceable graphic cassettes. It is a long-term cost-effective solution, especially if you wish to change your marketing message regularly. The replacement graphic cassette is just £44 which is more cost-effective than our cheapest roller banner, the grasshopper roller banner at £49. If you are attending exhibitions or venues that are undercover and you would like to advertise your products or services, these cost-effective roller banner stands will offer a high impact sales tool ensuring your message is seen by passers-by. If you feel that you would like your display to make an even more significant impact, you may wish to choose the Link2 roller banner. 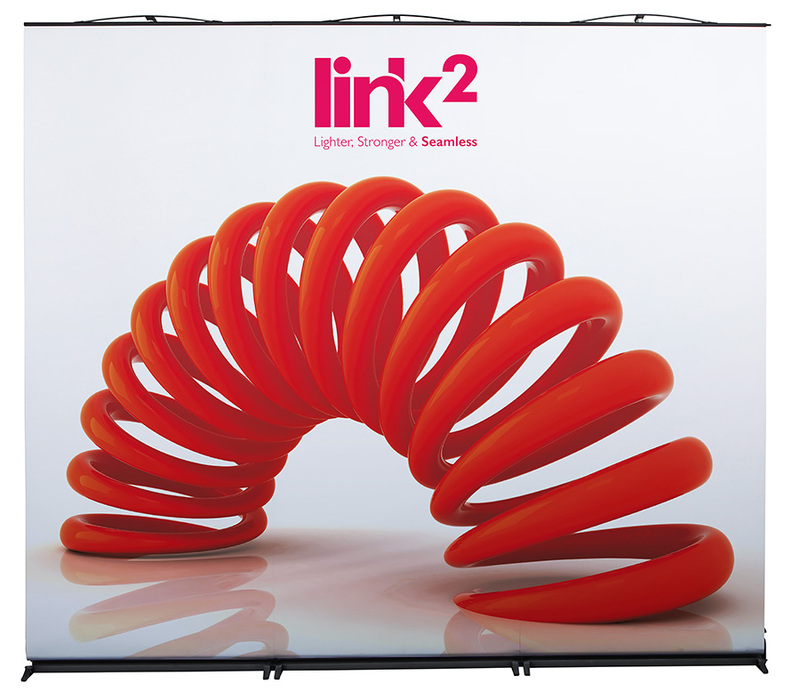 Link 2 is the world’s first fully linkable banner stand and has the ability to make a stunning display which offers maximum exposure. It can be used as a single banner for smaller events, or you can link multiple Link2 roller banners together to create a seamless exhibition backdrop display. For the first time, it also includes the ability to change graphics yourself without sending the cassette back to your supplier for new graphics. Simply order replacement graphics and fit them yourself when they arrive. This allows larger flexibility to adapt your stand for each exhibition event and marketing strategy at a lower cost of ordering a completely new banner. If you require an external roller banner stand for outdoor events, you must ensure that the display is weather resistant, fade resistant and robust. These types of display stands are incredibly portable and easy to carry and take just a couple of minutes to assemble and to pack away. The moulded base of the roller banner stand can be filled with water or sand to ensure the display does not topple in the wind. You may decide to have a dual double-sided roller banner stand which offers a double impact for your advertising. Our Thunder double sided outdoor banner stand includes all the features our traditional banner stands but with increased strength and durability making it ideal for outdoor display purposes. Thunder pull up banner stands are 2m high with printed graphics on both sides. Having a large visible graphic area will allow your stand to be visible from a range of angles and directions. It also is supplied with 4 heavy duty ground pegs, which once pegged down for stability will allow it to withstand high wind speeds. Making it perfect for any event even if the weather does unexpectedly change. Often used in reception areas, exhibitions, conferences, points of sale and retail outlets, roller banner stands can offer the visual display you are looking for. Using these stands is one of the cheapest ways of advertising and a great marketing tool. With their telescopic stands, they can be seen at a distance, giving a better field of vision. When placed at strategic locations, these stands offer the opportunity of providing passers-by with an insight into what you are advertising or promoting. It may be an idea to use our roller banner spot light above your roller banner stand. This can enhance your graphics and can really make them stand out. The display light is easily fitted to the top of the stand and is not intrusive. When at your indoor event you may find you have been positioned in a corner which is not as well-lit as the rest of the room, and the use of a display light will help draw the eye of the passer-by. Monitor Brackets and iPad displays are available as extras which are great to add an interactive element to your exhibition stand. If you are wanting a more simplistic display you can consider our shelf for pull up banners. Our additional shelving units are great for displaying a product or hold leaflets during your event. For more information on our roller banners call us on 01733 511030 or contact us.